Ladera Resort, St Lucia 5.0 out of 5 based on ratings. 4 user reviews. The Hottest St Lucia Honeymoon spot for romance + privacy is at Ladera Resort, St Lucia. This is Unforgettable Honeymoons top recommendation for a romantic hideaway- Ladera Resort. Ladera Resort is the perfect honeymoon hideaway on the beautiful island of St Lucia. A St Lucia honeymoon is not complete without a stop at Ladera, which has the most amazing views of the Pitons. 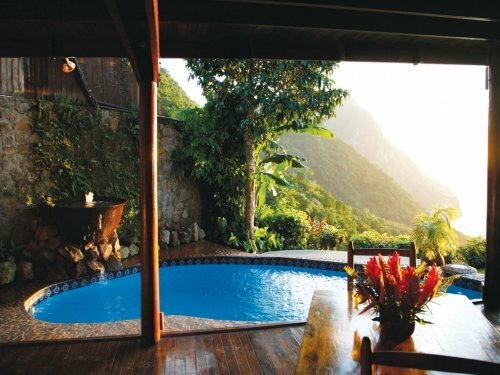 Ladera's open air exotic honeymoon suites sit atop a ridge overlooking the Pitons. Ladera is one of the most romantic places on earth. Unforgettable Honeymoons Ladera packages include extension stays at Sandals, Rendezvous resort, or Calabash Cove. Conde Nast Traveler readers have voted Ladera not only the "Best Hotel in the Caribbean," but they also gave it the highest score of any hotel in the world, ranking it the "Best of the Best" in the overall hotel category. The honor marks the first time in the 18 year history of the awards that a Caribbean hotel has appeared on the "Best of the Best" list. Incredible views and amazing service!! !